Do you remember freezer pops from when you were a kid or maybe you give them to your kids now. Ever read what is in them? Want to make your own freezer pops so you know what is in them? 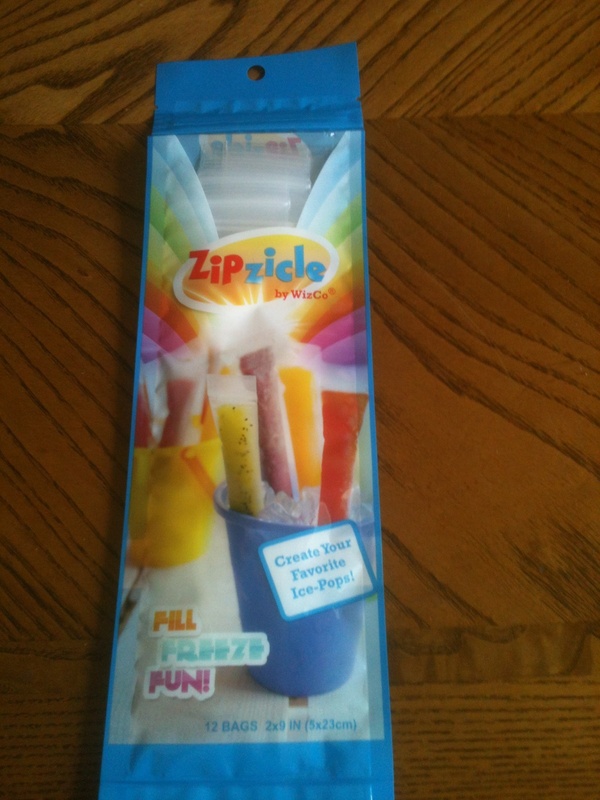 I found these great Zipzicle™ zip-top ice-pop bags. The zip top ice-pop bags are great! Now you can make your own Zipzicle™ use your own ingredients so you know what is in them, no sticks, portable, no mess, fresh, and recyclable. They are so easy to make too – blend, fill and then freeze. Wouldn’t it be great just to take some the fresh ingredients in your fridge or pantry and make something fresh and cool for your kids? How about a Rootbeer Creamzicle? An old fashioned taste in a brand new way. Place all ingredients in blender and blend until smooth. Fill Zipzicle bags using funnel or kitchen baster. 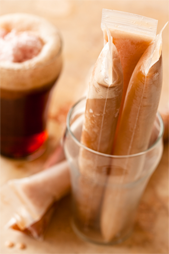 Place Zipzicles in an upright position within a container or mug before putting in the freezer. Freeze until solid and enjoy! Now that the warmer weather is coming and the kids will be out of school this would be a fun thing to make together. Let you kids pick their favorite flavors, freeze and then eat. I am thinking of all of my favorite flavors of summer and think this is a great way to get the kids to eat more fruit – add strawberries, raspberries or watermelon to the blender with a bit of juice and blend then pour into the Zipzicle™ bags and freeze. If you would like to buy Zipzicle™ bags you can do so HERE online. Zipzicle™ has offered 3 of my readers the chance to win their own Zipzicle™. You must be 18+ and have a US shipping address. Leave a comment on what kind of zipzicle you would like to make. Extra entries for each way you follow Kaisy Daisy’s Corner. Giveaway ends Jun 14, 2013. Love this! Since strawberries are in season, I would make strawberries and cream Zipzicles, I know my kids and myself would gobble them up! I think I’ll blend Kiwi with a touch of lime. YUM!! I love this whole concept!!! I can’t wait to get some and make smoothie-cicles for my daughter.. its so hard to find them in stores with actual fruit. I will be making strawberry banana smoothies with apple juice and freezing them for her all summer long! I am a food allergy adult, so I am psyched about this product!!!! I want to make an adult version “margarita” zipzicles. I plan on using these to freeze herbs from my garden with olive oil. Great way to store these for use during the winter months. fresh juiced pineapple! sounds like a refreshing treat on a hot California summer day! Thanks for the recipe. My nephew will love these! I’d make mine with grapefruit juice and vanilla ice cream, so refreshing in the summer. I would probably make our with fresh fruit – strawberries, blueberries, & kiwi. Oh, maybe even try to make watermelon too! Too many fruit combinations! frozen greek yogurt (plain–of course) and assorted fruits (berries, stone fruits) and sometimes something savory with veggies (cucumber, tomato, beets, carrots) maybe even rhubarb. OOOOHHHHH Coffee Lattes or Chai!!!!! I would make frozen yogurt with fruit zipzicles! mmmm 🙂 Thanks for the giveaway! I want to try the Rootbeer Creamzicle. Sounds yummy! I would use whatever fruit is in season to make ‘cicle’s as my 2 year old calls them. I love the breakfast idea with the warm weather coming! Definitely Rootbeer Creamsicle but also I would like to make Pineapple Coconut. I’m a weirdo so I’d probably mi xtouch of lime with strawberry. My husband would absolutely love this. He’s obsessed with popsicles and if I had this maybe he wouldn’t buy so many slurpies. Fresh strawberries sound really good. I would like to try the Blackberry Basil Lime Tequila ones for me. And my little one is obsessed with strawberry shortcake, so I think something along those lines would be fun. I love that I can make up different creations here! I’d like to make the watermelon freeze! These would be for my little great niece. She just loves cherry anything so I guess that would be the first one. Or the one you made ~ sounds delicious. I’d probably do a sangria zipsicle or a PB&J one with fresh strawberries! I would like to make a Strawberry Banana zipzicle. i would make a Pepsi Float! strawberry yum..would be g reat!